This testimonials section is for our clients and patients to share their positive experiences. We moderate this section to ensure accurate and positive testimonials. The comments you see are the opinions of our patients. Terms & Conditions: By submitting this testimonial you give us permission to reprint and to use the Testimonial in connection with our business. You also agree to the following: (1) We may reprint or use the testimonial at our discretion and without compensation; (2) We may use the testimonial with or without any name credit; (3) Our right to use the testimonial is perpetual and may be assigned by us; (4) We may use the Testimonial locally, nationally, or globally and such use may be made in any media, information, or communication platform (including Internet advertising) currently in use or later developed; and (5) You and not someone else has composed and submitted the testimonial. Backsmith Advanced Physical Therapy and BacksmithPhysicalTherapy.com is not responsible for any of the opinions or comments posted on our site. BacksmithPhysicalTherapy.com is not a forum for testimonials, however provides testimonials as a means for customers, clients, and patients to share their experiences with each other. 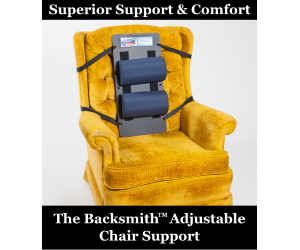 To prevent abuse, all testimonials appear only after they have been reviewed by management of Backsmith Advanced Physical Therapy. Views or commentary expressed are strictly the views of the reviewer, and may not reflect the views or opinion of the principles or staff of Backsmith Advanced Physical Therapy. By clicking on the Submit button you are agreeing to our Terms and Conditions stated above.